If you have or haven’t heard about the website XP Options this posting is for you. 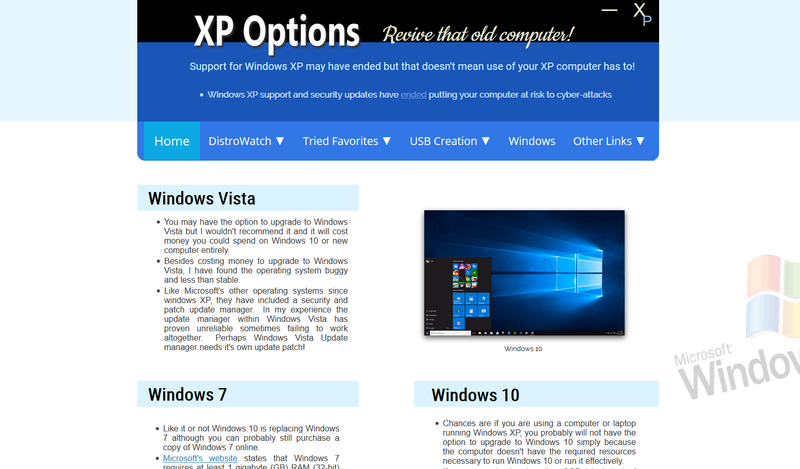 The XP Options website seeks to provide some helpful tips for all computer users of older Windows distributions but especially targets users left in the cold by a defunct security vulnerable operating system known as Windows XP Since Microsoft stopped issuing security updates for it, it is highly recommend that users of that OS move on to something more secure. XP Options is a small bridge to help you with that. I also want to introduce and recommend a new distribution of Linux for older computers (and new) called MakuluLinux 10 Aero Edition. The operating system emulates the look and feel of Windows XP, Vista, Windows 7 or Windows 10 using built-in themes. The core of the OS is Linux and it includes some great word processing software (WPS Office Suite) along with lots of pre-installed nuggets for helping one get online and to be overall productive. The Opera web browser is included with this distribution while Firefox and Chrome browsers can be added from the included software center. So if you haven’t already, MakuluLinux 10 Aero is definitely worth a look! Windows 10: The New Vista? Unfortunately, many people may remember an operating system they once had running on their computer called Windows Vista. This little nugget of fun of an operating system was great if you enjoyed trying to fix problems with a computer. Like most people, I enjoy using a computer to play games, browse the internet, use a graphics editor and for writing but tracking down the source of why audio doesn’t work or the computer won’t connect to the internet is not really what I call “fun”. So now it’s 2015 and we’ve turned a corner and a new operating system from Microsoft has come into our lives in the hope of making life easier, simpler and more fun. At least I think that’s the intention. But for me and many others our experience with this new revolutionary operating system called Windows 10 hasn’t really turned out all peaches and cream. In fact, today I pushed paused on a game I had been playing and then unpaused it to find the sound wasn’t working anymore. I exited the game, figuring maybe it’s a simple game malfunction (even though it’s been fine for months past). I then find myself on the Windows 10 desktop still without audio. This isn’t the only difficulty I have experienced with Windows 10. Just last week whenever I would start my computer the internet connection would be gone. Windows 10 troubleshooting would report no network adapter could be found. Really? All of a sudden? After a computer restart the connection would almost mysteriously return like a magic trick I was involved in. That is, until the next computer restart when the connection would be gone again. The connection had been fine for months before without a hiccup and so I figured maybe it was the cable from the extender or perhaps even the extender itself was failing. I decided to hard-wire my connection with a new cat5e cable directly to the router. This time even a restart of the computer wouldn’t bring the internet connection back. My internet connection appeared lost forever, at least on this computer. The only change to the computer I had noticed a few days before the lost connection was a Windows 10 update that had occurred. Hmmm.. Eventually the audio and the WI-FI connection would return but not before a few hours and days of troubleshooting using a different computer running a Linux, a new cable and updated driver–which I had to find online. Apparently Windows 10 isn’t as smart as we are led to believe. Lately, I have noticed an inexplicable sluggishness when restarting the computer and opening folders and an overall sense of incompleteness with my copy of Windows 10 that has been giving me an old feeling of yesteryear, as if I were still running a version of Windows Vista underneath it all. Now to be completely honest, I don’t believe Windows 10 is all bad news. In fact, I really like it’s appearance and potential. I saw Windows 10 during beta testing and had high hopes for Windows 10 and still do. 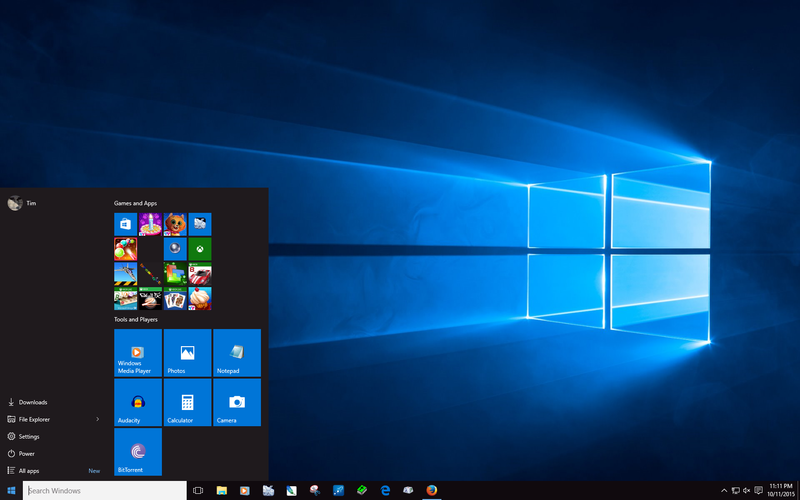 Visually Windows 10 has it going on, with its fresh-looking skin, but underneath its clean-looking exterior I am beginning to wonder why Microsoft released it. It might be just my opinion, but I don’t think Windows 10 is really ready for prime-time. Yet, maybe Microsoft knew that already and left themselves a loophole by giving copies away for free. In the meantime, I do hope things get better under the hood of Windows 10, and whenever I turn the computer on I’ll try not to keep thinking I’m using a new copy of Windows Vista. 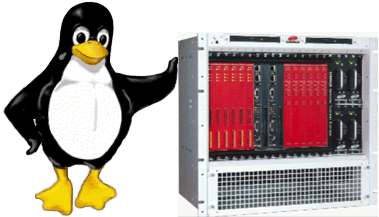 Makulinux is a distribution of the Linux operating system. There are hundreds of distributions of Linux each offering a unique flavor of Linux. Many distributions offer similar features and appearances while others differ by applications and tools offered with the distribution. Each distribution can offer various desktop environments. Many distributions or distros of Linux often feature all or a combination of the following desktop environments: Gnome, KDE, XFCE, Cinnamon and MATE (pronounced Ma TAY). These variations of desktop environments are most common and in my opinion are most eye appealing but there are other desktop environments available depending on the Linux distribution. For example, the Ubuntu distro includes only the Unity desktop environment. Desktop environments and distros for that matter, work better (or worse) on different computers depending on whether the distribution is placed on a laptop or desktop computer with a lot or a little bit of memory (RAM). The MakuluLinux version I have been using is with the XFCE desktop environment which I have found runs great on older laptop computers and also anything in-between. This is because the Xfce desktop environment is generally suited for older computers. However, as with many distributions of Linux there can be a slight learning curve in its overall operation, especially if you have been familiar with Windows. After one figures out how though, Linux distributions can be customized to your liking and some even offer nice application window eye candy. One such favorite is called wobbly windows. Move your application window(s) around and it really moves! Makulu is also fully customizable and includes a plethora of themes. MakuluLinux is no different when it comes to effects. MakuluLinux 9 32-bit xfce includes what is called the Compiz effects window manager while KDE desktop environments include the KWin effects window manager. One thing I really enjoy about MakuluLinux (32-bit verson only) is that it includes the option to turn effects on or off with a simple mouse click depending on the speed of your computer. MakuluLinux also features some great themes and software ready for your enjoyment. As much as I enjoy using MakuluLinux on my old Windows XP laptop computer (without Compiz effects on due to its extra resource requirements) I will note that I have had installation trouble with the normal edition of MakuluLinux Xfce 9. In my experience Makulu isn’t as easy to install as has been Ubuntu or Kubuntu among others– that is, without a little understanding of some basic Linux syntax. While I already noted that installing the normal 32-bit version of Makulu 9 Xfce failed for me, installing the 32-bit Makulu 9 Xfce Lite edition did not. The lite edition is the same as the normal edition but includes less on-board software (what I call bloatware). Once Makulu installs however, your choice of software packages can be downloaded anytime from the included software center! TinkerXperience wouldn’t be such a great name for a blog if I neglected to talk about some actual tinkering–Linux tinkering that is. Linux is an alternative operating system to Windows or OS X which is generally free aside from user donations. I discovered Linux a few years ago with Ubuntu but didn’t realize until recently there is more to Linux than Ubuntu. What is the difference between the terms Ubuntu and Linux? Linux is the system (operating system) the computer runs on but there are hundreds of distros or distributions of Linux. Each distribution features the Linux kernel (the underlying code) as it’s called to operate . We users see the results, which is what appears on the desktop and that can feature hundreds of variations or flavors of Linux. These variations are packaged within each distro and are what set a particular distribution of Linux apart from another. For example, the Ubuntu distribution features what is called the Unity desktop but it is still Linux. 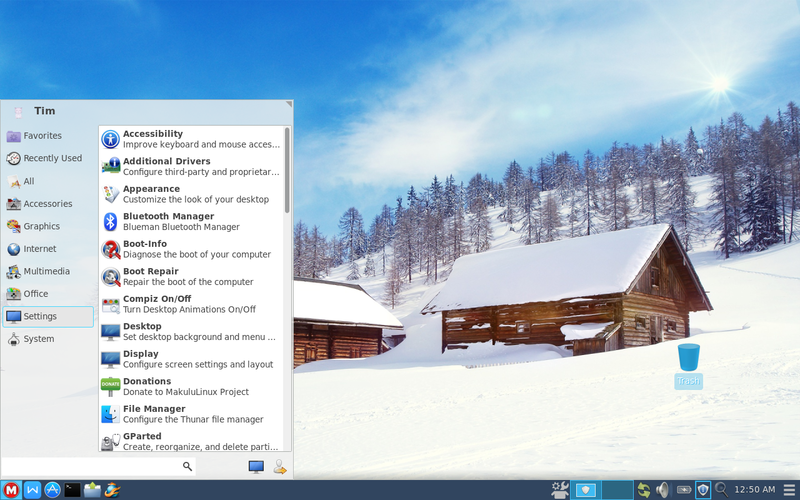 Visually speaking, instead of a task-bar located at the bottom of the desktop as in Windows, the task-bar is permanently fixed to the left side of the screen. Other features of Ubuntu are top left positioned control buttons (minimize/maximize) on each window opened such as is found on Mac computers. In up coming posts I hope to discuss some personal Linux tinkering in more detail when I discuss some of my favorite distributions! Got an old XP Computer you don’t want? Don’t throw it away! In the meantime, if you have one or know someone who has an old computer or laptop running Windows XP I have created a website addressing the issue of Microsoft’s end to XP support and some options for keeping that old computer running. An old Windows XP computer (that runs) has a lot of days left even if you don’t run Windows XP on it. In fact this blog post is coming to you from a former XP laptop computer now running MakuluLinux XFCE. 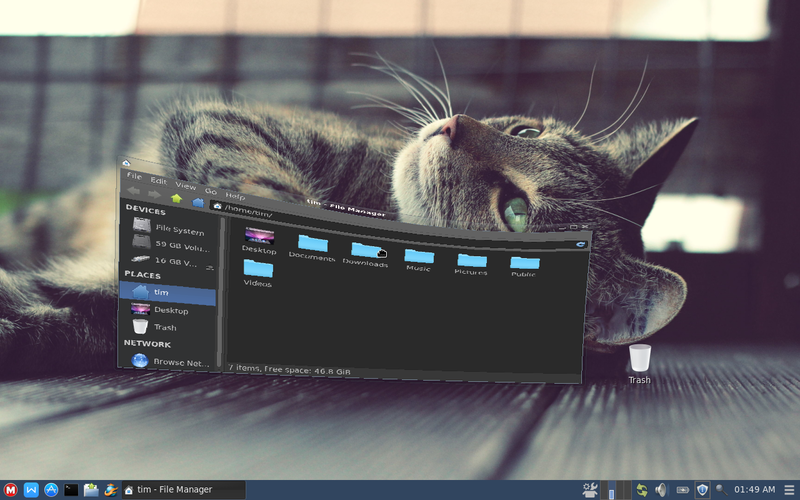 What’s Makululinux XFCE you ask? Find out next when I discuss MakuluLinux XFCE!